Looking for somewhere fun to take the family this weekend? Need a great date night idea or group activity with friends? Grab your friends, lace up your skates and shake up your weekly routine. You and your crew can come hang where the WBS Knights train. Along with the fun, we also rent hockey and figure skates size 8 (child) to 13 (adult). We recommend arriving at least twenty minutes before any given public skate time to allow time for your party to sign waivers, complete payment and rent ice skates. 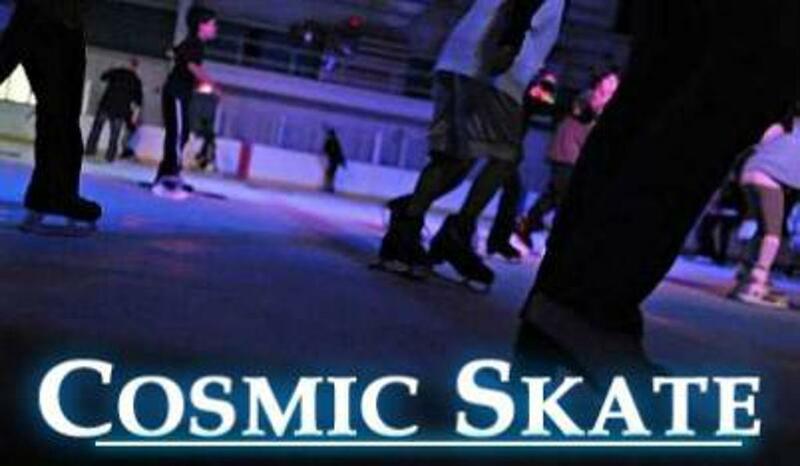 Join Revolution every Friday night for GLOW IN THE DARK Cosmic Skate. We have a DJ playing the latest hits, we have fun games on the ice and everyone is GLOWING! Revolution Ice Centre offers Public Skating sessions throughout the season. Skating is a great way to get out of the house, get some exercise and socialize. Public Skating is also an inexpensive family activity. 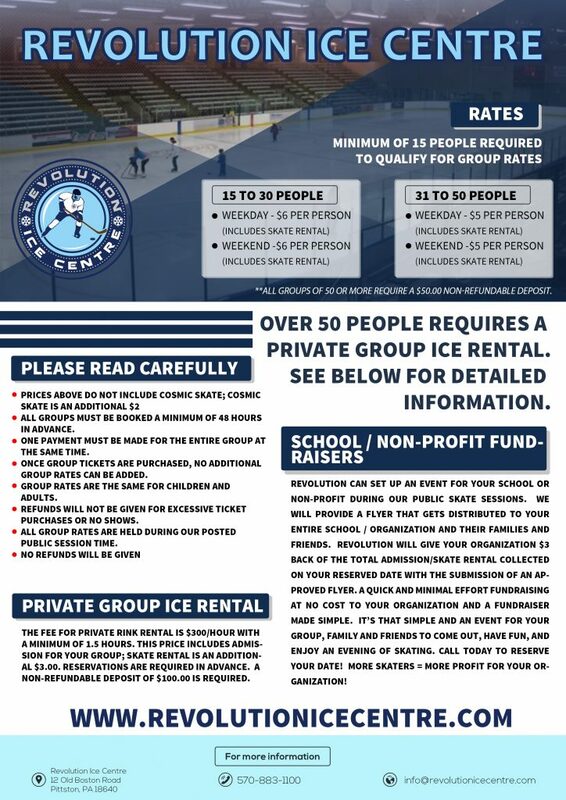 Revolution Ice Centre also offers group rates and discount passes, as well as birthday parties, school field trips, fundraisers and other group events. Please check our schedule, subject to change, and rates for more information. Don’t have skates? No problem! We have hockey and figure skates available for rent. All ages! All-skill levels! Great music and light show! Injuries that result from collisions or contact with other skaters or other individuals who are on the skating surface. Injuries that involve objects or artificial structures which are properly within the intended path of travel of the skater or other individuals. Patrons must wear skates when on ice. Skaters must keep moving at all times with the designated traffic while on the ice. Helmets are not required but are encouraged. Hockey and bike helmets are acceptable. All skaters must sign a waiver prior to skating. Skate at your own risk. No roughness, excessive speeding, racing, or weaving. Tag or other games and sticks or pucks is prohibited. No intentional sliding or diving on the ice or kicking or chipping of the ice is permitted. No throwing snowballs or any other objects. Skaters are not permitted to carry children or other items in the ice (cameras, electronic devices, handbags, etc). No Figure skating jumps or spins during public skate. 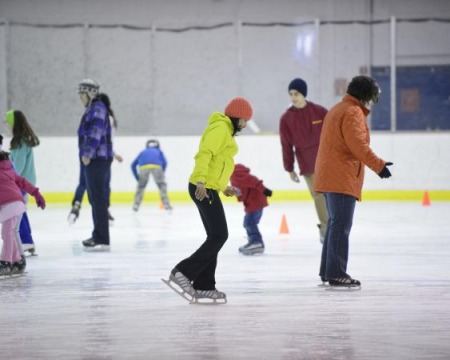 Beginner and novice skaters should be accompanied on the ice by an adult. Accompanying adult must wear skates. 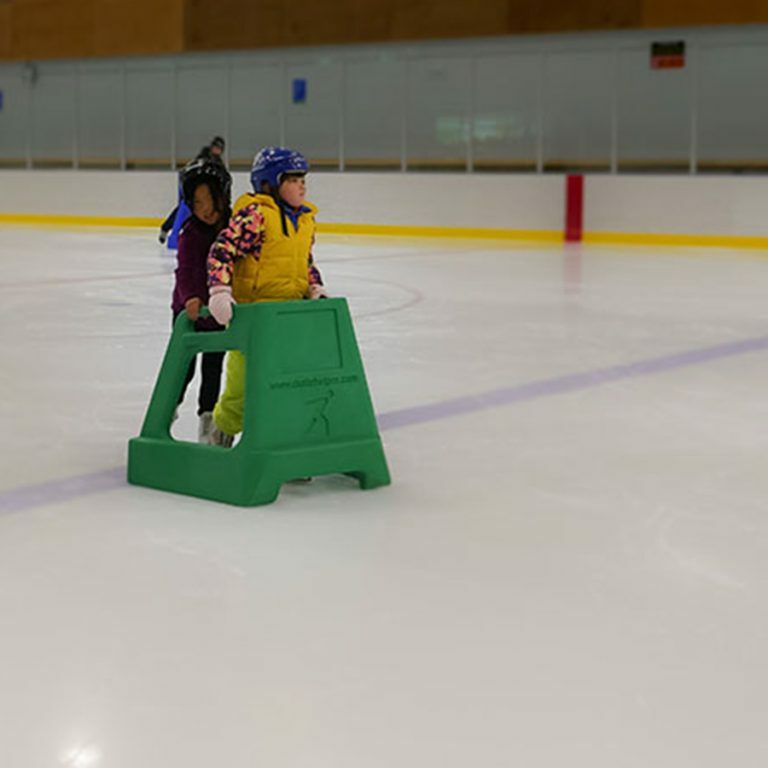 Blue skate helpers are to be used only by beginner skaters. No more than 2 people may skate together (No human chains). Do not sit on or lean over the dasher boards. No Skates are permitted on the bleachers or in any other unprotected concrete areas of the facility. No person is allowed in the players’ benches or penalty boxes during public skate at any time. Ice rink exit doors are to remain clear at all times. The use of tobacco products, alcohol, or illegal substances on the ice or on the premises is prohibited. Skate guards may issue time outs to anyone who repeatedly violates rules. Severe infractions may result in suspension from facility use. Follow all posted or stated facility rules: Anyone not abiding by posted or stated rules and regulations OR conduct that may endanger the safety of self or others may be asked to leave the ice and/or facility without refund.